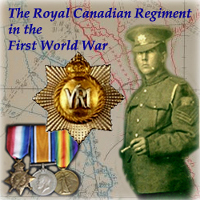 The following Officers, Warrant Officers, non-commissioned officers and soldiers of the 71st Canadian Infantry Battalion were casualties of the First World War. Following the War, the right of perpetuation of the 71st Battalion was granted to The Oxford Rifles. 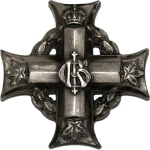 In the 1950s, The Oxford Rifles were amalgamated with The Canadian Fusiliers (City of London Regiment) and The Royal Canadian Regiment. 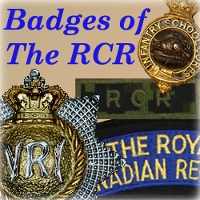 In 1958, the Regimental Senate of The Royal Canadian Regiment announced that the Regiment would accept all perpetuations from this amalgamation. 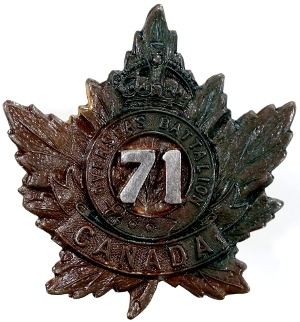 As the 71st Battalion did not go to the field in France and Flanders as a fighting unit, very few (if any) soldiers who enlisted with the unit would have still belonged to 71st Battalion at the time of their deaths. This list was developed through the transcription of the 71st Battalion's Sailing List, and then comparing that list of names to Ted Wigney's CEF Roll of Honour. 156 126155 Sergeant Joseph James Manton 19 Nov 1916 RCE Esquimalt Veteran's Cemetery, B.C.